7/6/12: WE'RE MOVING!!! And that means super-big deals FOR YOU! My family is moving to a new house soon, which means that Meitaicarrier.Com LLC is moving, too! What better way to celebrate that than to having a moving sale?? As always, thank you for supporting Work-At-Home Moms!! 6/3/11: MEITAICARRIER.COM LLC IS GOING GREEN! Come see the changes! * The cost of solid No Frills carriers is coming back down! See how! * Want a way to store your carrier? Try a recycled twill carrying bag! * What do repurposed fabric scraps and your house keys have in common? 2) Since the pieces of twill I'll be recycling leave me with remnants that aren't big enough to use in a full carrier, the leftovers will now go into making storage bags for your mei tai! These bags will feature snap closures, a carrying strap, and quick-fold instructions for your mei tai for only $2! 3) While I typically make pretty good usage of the fabric that goes into making carriers, there are still times when I'll end up with small pieces of fabric (both twill and print) that really aren't big enough to use even in quilting. Since I'm constantly looking for ways to reuse things, and with the help of the awesome people at Spoonflower.Com, I've taken my scraps of fabric and used them to create and stuff keychains made with specially-printed MTC fabric! Carry your keys in style for only $1! I hope that you're all as excited about these changes as I am! And there's still more to come! I know that some of you have been waiting eagerly for the MTC Mini doll carriers and the spiffy new Design Gallery. Trust me; they're still on the way! 4/5/11: It seems that people have been having trouble getting in touch with me by phone through my provider (Google Voice). The situation should be fixed now, so feel free to call me if you need to! 2/22/11: NEW FABRICS!!! Click on "Carrier Information" to see all the new print options that just came in! 2/14/11: LOVE IS IN THE AIR! This week only (from February 14th through the 18th), I am offering up custom slots for both the MTC Basic and the MTC Deluxe, with FREE SHIPPING! Strap color, print fabric, and customizations are all yours for the choosing! Visit the colors and fabrics pages to see what's new for 2011, and include your options when you checkout at HyenaCart. HAPPY VALENTINE'S DAY! 1/30/11: This just in! There was a package waiting outside my door on Friday. A brand new print, hand-picked by my husband, just for you babywearing dads! Click on the thumbnail for the gorgeous details! 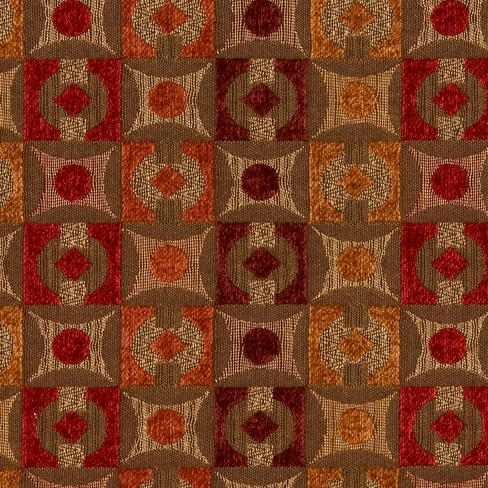 The print is called Nico Spice by Richloom Studio. This will replace the (sadly) out of print "Jason Circles" that Holly used to offer. I hope you're excited as I am to get your special guy into these new carriers! Custom slots: I look forward to helping you make you dream carrier come to life! 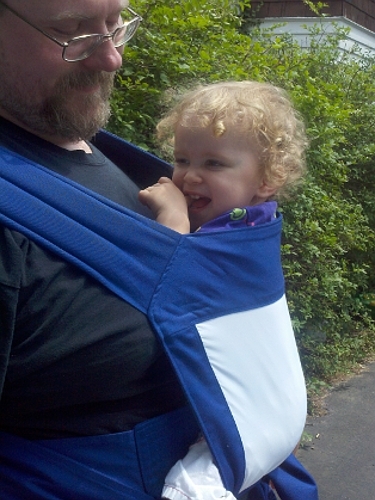 Wrap shoulders: Especially for those who like a more wrap-like feel to their carriers. MTC Minis: Doll carriers for boys and girls! When available, you will be able to have one made to match your own carrier!